Here’s a question for you about two females who have been in the news this week. 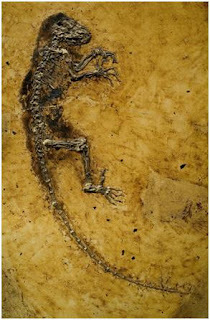 The first is the so-called Messel Lemur, a stunningly well preserved early primate about 48 million years old found in the oil shale of Messel, Germany. 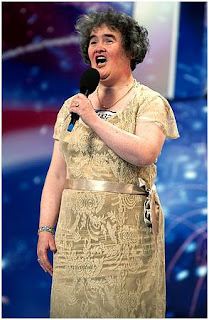 The second is Susan Boyle, the 48-year-old unknown Scots singer sometimes described as ‘chubby’ or ‘dowdy’, who created something of a national and international sensation in the Britain’s Got Talent television program. What links the two? There are of course any number of uncharitable answers to this involving perhaps the number ‘48’, ‘preservation’, ‘hair’ and ‘being female’. The real answer is that both raise interesting questions to do with the media. Let us consider first, the older of our two females. Three things are noteworthy. First of all, the Lemur (or proto-Lemur) was immediately proclaimed to be a ‘Missing Link’ and our great, great grandmother umpteen times removed. Whether or not this is the case is not my point here; the fact is it that it was an inevitable but clever piece of marketing. As a lemur, pure and simple, no one would care. I can’t resist using the British slang expression “no one would give a monkey’s”. (Please don’t look up the origin of this: although the expression itself is reasonably harmless, its origin is unspeakably rude.) However, rebrand it as ‘a missing link’ and the press will be banging on the door. The second smart trick was to give the creature (technically Darwinius masillae) the cosy little name ‘Ida’. My suspicion is that this is a tradition that goes back to 1974 when ‘Lucy’, more prosaically known as Australopithecus afarensis, was discovered in Ethiopia and has been a big hit ever since. So that was another nice marketing touch. A third is more subtle. In a rather curious (and possibly unprecedented) way, no sooner had news of Ida been announced in the scientific press when it was revealed that the BBC would be showing a programme on her the following day narrated by no less than the Blessed Monarch of Natural History, David Attenborough. This strikes me as very curious. The normal pattern in science (and I remind you I do know a little of what I am talking about here), is to publish the data and then wait for speculation, comment and criticism. In theory, once the dust has settled there will be something like a scientific consensus and this the point at which the press ought to be involved. Given the lead time to produce a TV programme suggests that the scientific team had been working closely with the BBC right from the start. I’m not suggesting there is anything wrong in what has been done: it’s just that this smacks of the press and science being a little too closely linked. That’s a worrying trend. With Susan Boyle – who went from utter unknown to international star within days – things are very interesting and I refer you to the Wikipedia section on her entry entitled ‘Social Analysis’. With nothing else to talk about apart from the biggest political scandal for several hundred years (that was irony) the popular press has been building up Ms Boyle to an astonishing degree. Yet those that live by the press can also die by it and this week Ms Boyle has made the headlines of the wrong sort for lashing out at people with a pretty foul-mouthed tirade. The papers are beginning to turn on her. *If you cannot find it in the standard dictionary of Russian Aphorisms don’t worry: I’ve just invented it. In last week’s blog I was lamenting the fact that I had had my geology classes halved in number and doubled in size. In the intervening week I have to say there has been very little apparent progress in college but I have had three very able first-year students say they want to switch to geology next year so I live in hope that public pressure will force something of a climb down. One factor that may have an effect is the imminent European elections. How so? Well it is generally expected that the ruling Labour Party will be massively damaged in these elections and be forced to throw out some sops to ordinary people (as opposed to bankers and the like) to avoid being cast into the outer darkness in the General Election that must occur within the next twelve months. So the hope is that they will find some money from somewhere and rescue education. Well, we live in hope! Many MPs have been pushing the expense system to the absolute limit: so for instance we find that entire homes and flats have been furnished at the public’s expense. Some of the claims have been either outrageous or banal: glittery toilet seats, jellied eels, moat cleaning, a floating ‘duck island’ for a pond, hair straighteners. While much of this is legal, it is either dubious or petty. A number of MPs have been exposed as creatively manipulating the system to make quite a tidy little profit. One ‘nice little earner’ has been what is now called flipping; a technique whereby a Member of Parliament switches his or her second home between several houses, which has the effect of allowing the maximisation of taxpayer-funded allowances. Other tricks have been buying rundown property, getting the State to refurbish it and then selling it at a personal profit before buying another one and so on. Some MPs have clearly been engaged in fraud and are being interviewed by the police and the tax office. In the resulting flurry of righteousness, recrimination and resignations, MPs have been quick to come up with excuses. These include such things as ‘accounting clearly isn’t my strong suit’, ‘I seem to have made a mistake’, ‘ I apologise for my unforgivable oversight’ and so on. The public have shown an astonishing appetite for these revelations, and still the scandal rolls on. The prurient desire to look into lives of those who rule us is almost universal and this scandal has allowed it with a vengeance. The fact that we are in a massive economic downturn has also exacerbated matters; had the country been booming I think we would have been much more forgiving. Anyway the point of this blog is not to say what everybody else is saying but to say something else. The most obvious Christian comment is that given that modern British society has become separated from any creed or ethical basis this sort of thing is hardly surprising. I have no doubt that such scams were present in the past: but were they ever so endemic and were they ever quite so wide ranging? In some cultures – those of you who know my background will guess where I am referring to – it is expected that the politicians are corrupt and will defraud the nation. We had hoped otherwise here. A more subtle point is that it is now evident we have lost the servant ethos that goes with Christianity. MPs are ‘elected to serve’ a particular constituency. Not, you note, to rule. With the death of the servant ethos what has emerged is an astonishing arrogance; a wilful belief that as a Member of Parliament you have a right to plunder the system. Now, one of the most striking features of the Christian faith is its outrageous and irrational celebration of service. There seems little question even in the eyes of those who are sceptical about the authenticity of much in the gospels that this goes back to Jesus of Nazareth. (See for example Mark 10:45: “For even the Son of Man did not come to be served, but to serve, and to give his life as a ransom for many.”) Sadly, in the present scandal we are beginning to have sketched out what politics looks like when men and women rule rather than serve. We do not like what we see. Let me begin by a little bit of background. Around 10 years ago Wales was granted some degree of independence within the complex geographical unit that is the United Kingdom. Its governing body, the Assembly (which seems to increasingly bear less and less resemblance to the benign and competent Assembly of my novels), has both jurisdiction and funding control over a few limited areas. One of those areas is education. Recently, partly due to pressures caused by the recession and partly due to what seems to be incompetence, they have managed to cut funding to many schools and colleges that provide education for our 16- to 18-year-olds. One of those badly affected is my college, where we have something like a £400,000 shortfall. I hasten to add that our academic record is exemplary, but these days being good doesn’t seem to be enough. (Actually, it seems that you are better off being a poor performer because the trend is to throw money at failures rather than successes.) Well this week we were told that there would have to be major cuts and various drastic measures including increasing class size and reduced course options. I have been moderately badly hit by this. From teaching almost nothing but geology I will now have to diversify into geography and a wider area of environmental studies. And, on current numbers, I will have class sizes of around 24. Now of course all this may change (prayers are welcome) but the mood has been pretty glum in college and I have to say I have felt pretty discouraged. Had it been financially feasible I might have been tempted to hand in my resignation this week on the grounds that educational standards are likely to be compromised. But it wasn’t feasible. I consoled myself with the thought that I once ran an academic department that survived a direct hit from a tank shell, an assassination and an invasion. So I will try to grin and bear it. Anyway, what I have found interesting is that a number of people who are more badly affected than me are less fed up about it. Some of them are not, as far as I know, Christians or believers in God. This raises an issue that I have noticed before: Christians can get upset and worked up over things that other people are largely unaffected by. In fact it may even be – I have no figures to prove it –that there are slightly higher numbers of depressives in Christianity than outside. What’s going on here? How does this square with our songs of joy and our talk of victory? On this basis you can see that we expect life’s little tales to have happy endings. And, all too frequently, they don’t. If you understand this you can see why perhaps we more easily get depressed when unrequited nastiness occurs or unjudged stupidity triumphs. There are two answers to the conundrum we find ourselves in. The first is to lower our expectations – and that I am reluctant to encourage; I feel we must always aim high and hope for the best. The second is to remind ourselves that we do not here see the full picture. As the old image goes, what we see is merely the back of the great tapestry and here there are many random and tangled threads. We have not yet seen the real end of the story. I am not of course defending depression; if you are suffering from it I wish you a speedy recovery. But if it is the depression caused by the gap between high idealistic hopes and a dismaying reality then you deserve every sympathy. Far better to dream and be frustrated than not dream at all. For various reasons time has been at the forefront of my thoughts quite a lot this week. One reason is that I have finished my teaching of AS students; those totally ignorant fresh-faced kids I first met in September are now slightly less ignorant and about to face their first exam on Tuesday. My, how time passes! Secondly, I have been looking through boxes of old photographic slides to try and find some images suitable for a talk. It has been slightly disconcerting to see images I had long forgotten, and very disconcerting to find, on the other end of the slide viewer, a youthful me staring back across the gulf of years. Thirdly, I got the recent Geological Society of London annual bulletin and read obituaries of people including one who I knew pretty well. I struggle with how someone who once existed in a most solidly flesh and blood fashion is now no longer with us. Time and its passage disconcerts us for several reasons. Firstly, it is of course an ‘intimation of mortality’, a reminder that our tenure of this world is utterly temporary. Second, it is also something of a reminder of the futility of so much that human life is centred on. As I read the obituaries of some of those whose names were unknown to me, I realised that many of them had once had only the briefest and most ephemeral moments of glory. Some had been advisers to long-forgotten governments, others fashionable exponents of now discredited geological ideas, and still others finders of now exhausted oilfields. Time drains the value of most achievements. Yet the third disconcerting aspect of time is perhaps the most subtle. It is simply this: we do not in any shape or form understand what ‘time’ is. We measure something that we call time; we are aware that time passes (but what exactly does that mean?). Yet we cannot hold time, reverse time or store, buy or sell it. Time remains an utterly alien and unfathomable substance. It is presumed to have started with the Big Bang but even that remains an uncertainty. In every sense, time remains the most remote and elusive of concepts. And here Christian friends, I draw to your attention the fact that time is an interesting point to consider if you ever find yourself up against a wall in an argument about God. You know the sort of thing; that confident sneer ‘Where is your God? Show me him and I will believe in him. Go on! Prove his existence’. You may at this point choose to refer to time. There are innumerable questions that can be raised. What is time? Can the existence of time be demonstrated? When did time begin? In time we have a commodity whose existence everybody accepts yet which cannot be proved in the laboratory. Time demonstrates the inadequacy of the human mind. It does not to my way of thinking prove the existence of God. It is however suggestive that we ought to be very wary about confidently asserting that only those things that we can touch, see, measure and understand have a reality. Have a good week. I hope to write again in another seven days time; whatever that really means. At the start, let me say that this blog is not really about British politics; it is about something else far deeper. I actually wonder if it doesn’t touch on something of fundamental and rather worrying importance for the evangelical church. But let’s start with the politics. One thing that has become apparent in Britain over the last week or so – although it has been looming for some time – is that what has long been called ‘New Labour’ is finished. The financial debacle, the massive rises in unemployment and various other scandals have so doomed the present administration that wherever you look on the storm-tossed ship that is the Labour government you can see people desperately running around looking for seaworthy lifeboats. Indeed so catastrophic is the pending electoral disaster that most of them seem reconciled never to play a part in politics again. A generation in the wilderness looms. The background is worth repeating. As the Wikipedia article helpfully puts it, the traditional Labour Party ‘was in favour of socialist policies such as public ownership of key industries, government intervention in the economy, redistribution of wealth, increased rights for workers and trade unions and a belief in the welfare state as well as publicly funded healthcare and education’. After 20 years in which good old-fashioned Labour was so out of sympathy with the contemporary world that it was unelectable, Tony Blair and his colleagues (one is tempted these days to use word cronies) created a rebranded and updated version of the Labour Party: New Labour. New Labour was a subtle creation. On the one hand it claimed complete continuity with the past. Traditional supporters were reassured that it was still Labour: at party conferences, the followers of Blair sung the same old songs, cheered the same slogans and assented to many of the old aspirations. Despite considerable misgivings, long-term Labour supporters were reassured that all that they had held dear was still present. Yet on the other hand New Labour now presented a friendlier face to the public. It was smoother, sleeker, more contemporary and, above all, more acceptable. Much of the old confrontational language about class struggle and social justice was no longer heard: the party was utterly remarketed. The floating voter was charmed and under the chameleon-like Tony, New Labour achieved a massive 179-seat majority in the 1997 general election . It has retained power until the present. Yet now, as the wheels spectacularly spin off the wagon of the New Labour enterprise, the old Labour supporters are saying that they knew all along that this would happen. All their misgivings as to whether New Labour was actually Labour in any real sense have returned with a triumphant vengeance. It certainly now seems that, beneath all the words and new slogans, whatever the Blairite project was, it wasn’t really Labour at all. It was a charade, the survivors of old Labour say, and the fact that it has come to such a sticky end is utterly predictable. Well, I have my reservations about both Old and New Labour and Old and New Conservatism too. In fact, I am increasingly thinking that the roots of our national problems lie too deep for politics to change. Nevertheless I think the account of New Labour – so clearly now in its final chapter – is worth us evangelicals thinking about. Why? The answer is this. Those of us who are contemporary evangelicals claim that we are part of a great and honourable lineage going back through the Victorians as far as the Puritan reformers. We count men such as Bunyan, Wesley, Whitfield, Spurgeon and Lord Shaftesbury as our spiritual ancestors. We sing the same songs (well a few of them, at least). We pronounce the same mantras. We read the same Bible. We have the same creeds and we hate the same sins. And as I wonder whether that is indeed so I look at the tattered and beaten remnants of New Labour. And somehow, I am strangely afraid.